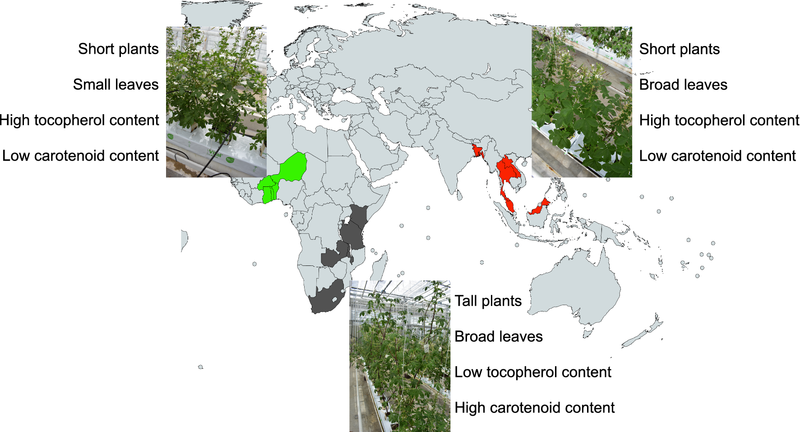 The variability in nutrient content and morphology in Gynandropsis gynandra is associated with the geographic origin of the accessions and provides a basis for breeding for higher levels of vitamin C, carotenoids or tocopherols in higher-yielding cultivars. The online version of this article ( https://doi.org/10.1007/s00425-019-03142-1) contains supplementary material, which is available to authorized users. Tropical areas of the world are endowed with a rich diversity of edible plant species with tremendous potential to contribute to food security, human health and poverty alleviation (Cullis and Kunert 2017; Pinela et al. 2017). However, most of those species are niche or orphan crops with a regional or local importance and often overlooked in breeding programmes (Sogbohossou et al. 2018). With the recent impetus for improved food quality, there is an increasing interest in diet diversification and breeding for highly nutritious crop cultivars. A critical step of this process is to understand the natural variation in phytochemical profiles in the crop of interest. Plant species with broad geographic distributions experience a wide range of biotic and abiotic conditions which thus can drive the evolution of variation in morphology, phytochemical profiles and interactions with other organisms (Millett et al. 2018). A broad sampling of accessions representative of the distribution and environment of the crop is important for maximizing the potential morphological and chemical (nutritional content) variation. Broad diversity is also needed to understand the potential genetic and environmental effects on the observed phenotypes. Such wide-scale studies are particularly critical for emerging orphan crops which have an untapped potential for improved human nutrition and health. Orphan vegetables are particularly important for local communities as they can easily be cultivated year-round and are affordable sources of nutrients (Yang and Keding 2009). Moreover, they substantially contribute to local economies. For example, in sub-Saharan Africa, the market of indigenous vegetables is worth billions of USD (Weinberger and Pichop 2009). Unfortunately, most studies that analyse the nutritional value of these species often focus only on local germplasm collections (Kengni et al. 2003; Kumssa et al. 2017). Gynandropsis gynandra (syn. Cleome gynandra) is an orphan leafy vegetable belonging to the Cleomaceae family, the sister family to Brassicaceae. The species is a C4 plant that is widespread in tropical areas of the world (van den Bergh et al. 2014). In several communities in Africa and Asia, the plant is harvested in the wild or cultivated in home gardens. Leaves, young shoots and occasionally flowers are eaten boiled in sauces or stews, but leaves can also be blanched and dried for preservation (Flyman and Afolayan 2006; van Den Heever and Venter 2007). There is an increasing awareness of the health benefits of the regular consumption of indigenous leafy vegetables which is enhanced by their availability and affordability. Thus, G. gynandra and other orphan leafy vegetables are increasingly cultivated and sold in urban areas of several African countries. To keep pace with the growing demand in these vegetables, value chain development for these species should go together with breeding efforts. Providing farmers with high-yielding and nutritious leafy vegetable cultivars which meet consumers’ requirements is therefore an overriding challenge for breeders (Sogbohossou et al. 2018). Important nutrients in orphan leafy vegetables that can be improved and bred for include carotenoids (pro-vitamin A), tocopherols (vitamin E) and ascorbic acid (vitamin C). Carotenoids and some of their metabolites play a protective role in many reactive oxygen species (ROS)-mediated disorders, such as cardiovascular diseases, several types of cancer and neurological, photosensitive or eye-related disorders (Fiedor and Burda 2014). Tocopherols have vitamin E activity in mammals, with α-tocopherol and γ-tocopherol exhibiting the greatest effects. These activities involve protecting membrane lipids from ROS damage, acting as anti-inflammatory agents, and protecting against degenerative diseases (Miyazawa et al. 2011; Usoro and Mousa 2010). The intake of vitamin E is generally low and very similar in both developing and industrialized countries (Jiang 2014). Ascorbic acid plays a critical role in cancer treatment, the prevention and/or therapy of asthma, allergic rhinitis, atopic dermatitis, cardiovascular diseases, obesity, neurodegenerative diseases, hypertension and autoimmune diseases (Combs Jr and McClung 2017). For improving crops such as G. gynandra, it is important to establish their nutritional qualities and variation in these and other morphological traits in a broad collection of germplasm. Previous studies have demonstrated that individual accessions of Gynandropsis gynandra leaves are rich in nutrients including carotenoids, vitamin C and minerals (Neugart et al. 2017; Odhav et al. 2007; Omondi et al. 2017; Schönfeldt and Pretorius 2011; Uusiku et al. 2010; van Jaarsveld et al. 2014). Variation between accessions of G. gynandra originating from East and Southern Africa showed variations in mineral levels and various health-related compounds including vitamin C, flavonoids, phenolics and glucosinolates, as well as in morphological traits (Jiménez-Aguilar and Grusak 2015; Omondi et al. 2017). A more extensive set of morphological characters of germplasm from Asia and East–Southern Africa at the World Vegetable Center revealed geographical patterns of variation (Wu et al. 2017). A set of nine accessions of G. gynandra from East Africa, West Africa and Asia was used to analyse variation in C4 photosynthesis-related traits coupled with a phylogenetic analysis based on sequences of the internal transcribed spacer region and demonstrated trait variation that clustered according to geographical origin. The accessions from Asia and West Africa were more closely related to each other than with East African accessions (Reeves et al. 2018). The aim of the present study was to investigate the natural variation in morphological features and nutrient content within G. gynandra to provide baseline information for multiple trait breeding strategies. The plant material used included 76 accessions that cover a wider geographic distribution than the aforementioned studies, including accessions from West Africa, East and Southern Africa as well as Asia. By targeted nutrient analysis, we investigated the variation in carotenoids, tocopherols and ascorbic acid and their association with morphological variation. We specifically address the following questions: What is the extent of variation in morphological traits and levels of nutrients in the collection? Is there a relationship between the morphological characteristics of the species and the production of nutrients? Can both morphological traits and nutrient content discriminate the accessions according to their geographic origin? We also discuss the significance of our results for G. gynandra towards breeding for improved nutritional value and leaf yield. A total of 76 diverse accessions of G. gynandra were selected from germplasm collections of the World Vegetable Center, the Laboratory of Genetics, Horticulture and Seed Science in Benin, the University of Ouagadougou in Burkina Faso and the Kenya Resource Center for Indigenous Knowledge. The selection of these accessions considered the variation in plant architecture and geographical origin in each collection. The detailed list of accessions and their provenance is presented in Table 1. The plants were grown under irrigated conditions with a defined light period (16-h day/8-h night) and temperature (24 °C day/20 °C night) in a greenhouse at Wageningen University from December 2016 to April 2017. The seeds were germinated on coco peat, and three seedlings per accession were selected 1 week after sowing and transplanted on rockwool blocks. From each accession, 10–15 leaves were harvested 8 weeks after sowing, immediately frozen in liquid nitrogen, bulked per accession, ground into a fine powder and stored at − 80 °C until nutrient analysis. A pooled sample of leaves from all accessions was prepared and used as technical replicates for determining analytical variation during the biochemical analyses. The morphological characterization of the accessions was conducted using a set of 27 descriptors including 15 quantitative and 12 qualitative scores (Supplementary material 1). Quantitative traits assessed included: days to germination, flowering time, plant height, stem diameter, leaflet length, leaflet width, leaf area, petiole length, filament length, gynophore length, androphore length, pedicel length, pod length, pod width and 1000-seed weight. Qualitative traits observed included: plant habit, branching habit, stem colour, stem hairiness, leaf blade lobbing, leaf colour, leaf pubescence, leaf oiliness, leaflet shape, petiole colour, flower colour and leaf margin shape. The flowering time was recorded as the number of days from germination to flowering. Five hundred milligrams fresh weight of ground leaves was freeze-dried overnight and extracted with 4.5 ml of methanol/chloroform (1:1, v/v) containing 0.1% butylated hydroxytoluene (BHT) as antioxidant and 10 µM Sudan 1 as internal standard. After vortexing, samples were sonicated for 15 min and centrifuged at 2500 rpm for 10 min. Then, 2 ml of the supernatant was transferred to a new tube and dried under a gentle nitrogen flow. The dried samples were dissolved in 1 ml of ethanol containing 0.1% BHT, sonicated for 5 min and centrifuged at 2000 g for 5 min. The clear supernatant was transferred to amber vials for high-performance liquid chromatography (HPLC) analysis. HPLC analysis was performed according to Wahyuni et al. (2011) using a YMC Pack reverse-phase C30 column (250 × 4.6 mm; 5 μm) coupled to a 20 × 4.6 mm C30 guard (YMC Inc. Wilmington, NC, USA), maintained at 35 °C. Chromatography was carried out on a Waters system consisting of a no. 2890 quaternary pump, no. 2996 photodiode array detector (PDA) and no. 2475 fluorescence detector. The mobile phase used was methanol, tert-methyl butyl ether and water/methanol (1:4, v/v) containing 0.2% ammonium acetate. Flow rate was 1 ml/min. Data were collected and analysed using the Waters Empower software. Carotenoids were detected by setting the PDA to scan from 220 to 700 nm. Measurements for β-carotene, α-carotene and lutein were taken at 478 nm, violaxanthin at 440 nm, chlorophyll b at 470 nm and chlorophyll a at 665 nm. Tocopherols were detected by excitation at 296 nm and emission at 340 nm (Supplementary material 2). Quantitative determination of compounds was conducted by comparison with dose–response curves constructed from authentic standards. To check the technical variation, including extraction, sample analysis and data processing, quality control samples were prepared from pooled leaf material of several randomly chosen accessions, extracted using the same procedure and injected after every eight accession sample extracts. The extraction and analysis of ascorbic acid (vitamin C) was made as previously described by Wahyuni et al. (2011). An extraction solution of 5% metaphosphoric acid in purified water containing 1 mM diethylenetriaminepentaacetic acid was prepared. Three hundred milligrams of frozen and grinded material was weighed in cold 2-ml Eppendorf tubes and 1.2 ml of ice-cold extraction solution added. The extracts were vortexed, sonicated for 15 min and centrifuged at 2500 g for 20 min. The supernatants were filtered over through 0.2-µm polytetrafluoroethylene filters and pipetted into amber vials for HPLC–PDA analysis using the same Waters HPLC system as described above. Separation was made at 30 °C using a YMC-Pro C18 column (YMC Europe GmbH; 150 × 3.9 mm) with 50 mM KH2PO4 buffer (pH 4.4) as eluent at a flow of 0.5 ml/min. Quantification was made based on absorbance at 260 nm, using a calibration curve of an authentic l-ascorbic acid standard from Merck. Retention time of chromatographic peak of ascorbic acid in plant extracts was verified by co-elution with the authentic standard (Supplementary material 2). As performed for the previous analysis, quality control samples from pooled leaf material of all accessions were extracted using the same procedure and injected after every eight accession sample extracts. The results were presented as means ± standard deviations from the three regions of origin of the accessions. Multivariate analysis of variance (MANOVA) and univariate analysis of variance (ANOVA) were performed to test variations among regions of origin for all the quantitative variables. The p value ≤ 0.05 was used to denote significant differences between mean values determined by one-way analysis of variance (ANOVA). The Bonferroni post hoc test was used to denote statistically significant values at p ≤ 0.05. Factorial analysis of mixed data (FAMD) and a hierarchical cluster analysis (HCPC) from the package “FactoMineR” (Le et al. 2008) were performed on combined quantitative and qualitative data to identify discriminating traits and group the accessions. The correlations between analysed variables were assessed using Pearson’s correlation coefficient, and their significance was evaluated by Student’s t test. Statistical analyses were performed using R software (R Core Team 2017). We found significant levels of variation for all our morphological traits in our broad collection of G. gynandra that includes 22 accessions from Asia, 34 from East–Southern Africa and 20 from West Africa (Table 1). The variability in quantitative morphological descriptors in the collection is summarized in Table 2. All the quantitative traits showed significant variation among accessions. 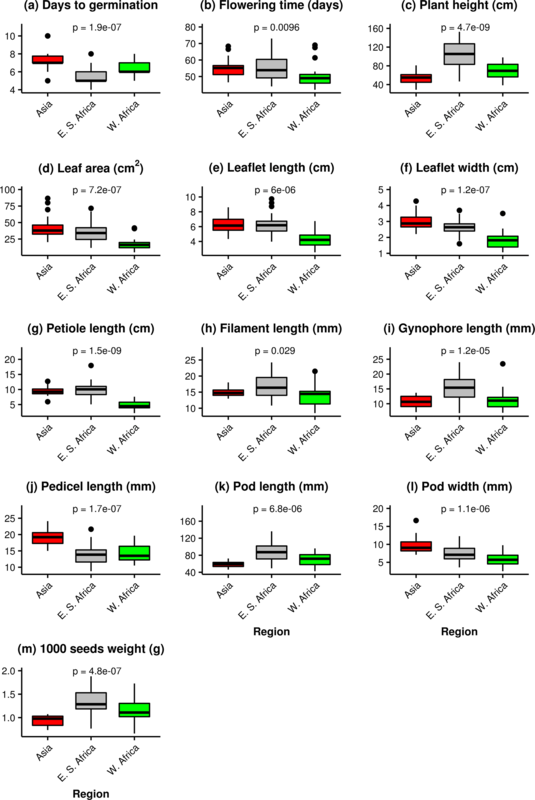 The coefficient of variation among the traits was greater than or equal to 25% except for flowering time (14%), filament length (22%), androphore length (24%) and 1000-seed weight (24%). The highest coefficient of variation was obtained for leaf area (52%). Despite the low coefficient of variation observed for flowering time, this trait ranged from 42 days in ODS-15-144 (WA19) to 73 days after germination in TOT8915 (ESA26), providing significant variation for potential changes within a breeding programme. Overall, all accessions in our study flowered later than in previous studies. For different sets of accessions from Eastern and Southern Africa, flowering time varied between 31 and 40 days in the field in Kenya (Omondi et al. 2017) and between 20 and 48 days in the field in Taiwan (Wu et al. 2017). The shorter flowering time in these studies might be explained by the variation in temperature, day length and fertilization schemes used but could also be due to the fact that different sets of accessions were used in these studies. 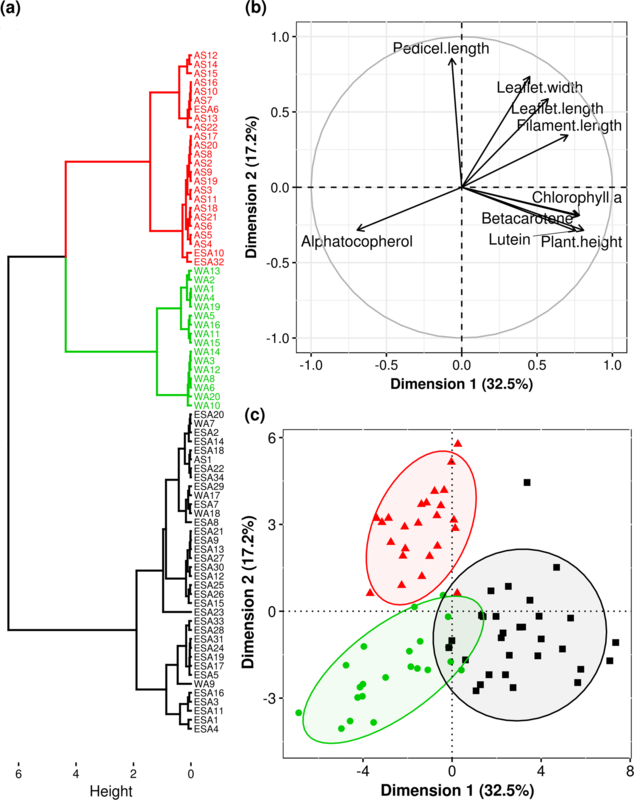 All the quantitative morphological traits showed significant differences with geographical origin except stem diameter and androphore length (Fig. 1). For example, East–Southern African accessions germinated earlier than West African (p < 0.01) and Asian (p < 0.001) accessions (Fig. 1a). Early flowering occurred in West African accessions, while late flowering accessions were from East and Southern Africa (Fig. 1b). West African accessions had lower leaf dimensions compared with accessions from the other regions (p < 0.001) (Fig. 1d–g). East and Southern African accessions had flowers with longer gynophores (p < 0.001) and filaments (p < 0.05) compared with accessions from the other regions (Fig. 1h), and similar trends were observed for pod length (p < 0.001) and seed weight (p < 0.001) (Fig. 1 k,m). Asian accessions had shorter (p < 0.001) but wider pods (p < 0.001) than African accessions (Fig. 1k,l). Wu et al. (2017) used the same set of quantitative descriptors excluding leaf area and days to germination to characterize a collection of 242 accessions of G. gynandra from East–Southern Africa (n = 174) and Asia (n = 44). Overall, the authors found that accessions from East and Southern Africa had significantly higher average values than Asian accessions for all quantitative descriptors except leaflet width. In our case, even though East–Southern African accessions had higher average values than Asian accessions for leaf area, flowering time, petiole length and filament length, there was no significant difference between both regions for those traits. The 30 accessions from East and Southern Africa characterized in Kenya (Omondi et al. 2017) had shorter plants (66.6 ± 7.2 cm) compared with our results (109.1 ± 25.0 cm) and those of Wu et al. (2017) (115 ± 27 cm). Similar to the case of flowering time, the differences in plant height could also be explained by a difference in environmental conditions, cultivation practices and the germplasm collections used. The variation in 1000-seed weight was comparable between all the studies and ranged from 1.44 to 1.71 g in Kenya (Omondi et al. 2017), 1.0 and 2.2 g in Taiwan (Wu et al. 2017) and 0.7–1.8 g in our study. The collection exhibited a wide variation in qualitative morphological descriptors. The geographical origin of the accessions was significantly associated with plant habit, leaflet shape, leaf colour and stem hairiness. Accessions with a spreading growth habit originated from West Africa (35%) and Asia (4.5%), while all accessions from East–Southern Africa had an upright (17.6%) or intermediate (82.4%) habit. Most Asian accessions (77.3%) had deltoid leaflets, while African accessions had either elliptic or lanceolate leaflets. Only East African accessions had dark green leaves (44.1%), while accessions from the other regions had green or light green leaves. None of the accessions from Asia had a glabrous stem and all exhibited various levels of stem hairiness from moderately hairy to densely hairy. In contrast, West African accessions had a high percentage of glabrous stems (65%) and none of them had a densely hairy stem. The carotenoids detected in the leaves included lutein, violaxanthin, α-carotene and β-carotene. Chlorophylls a and b were also quantified and provided a reliable measure of the “greenness” of the leaves. The total carotenoids concentration varied from 36.9 µg/g FW in ODS-15-094 (WA15) to 95.8 µg/g FW in BAR1807B (ESA1). The predominant carotenoids were lutein (21–56 µg/g FW with a coefficient of variation of 19.7%) and β-carotene (11.8–34.9 µg/g FW with a coefficient of variation of 19.5%), accounting for an average of 56% and 35% of the total carotenoids, respectively. Overall, East–Southern African accessions had higher levels of carotenoids and chlorophylls compared with West African and Asian accessions except for violaxanthin for which no significant differences were observed among regions (Fig. 2a–f). Previous studies on the species reported higher levels of β-carotene: 41.2 µg/g FW (Schönfeldt and Pretorius 2011), 59.4 µg/g FW (van Jaarsveld et al. 2014) and 57.1 and 64.7 μg/g DW (Neugart et al. 2017), and analyses were performed on a single genotype. Such differences in absolute levels between studies may be explained by the differences in the growing conditions, developmental stages of leaves and the genotypes analysed. The main forms of tocopherols determined in all accessions were α- and γ-tocopherols (vitamin E). 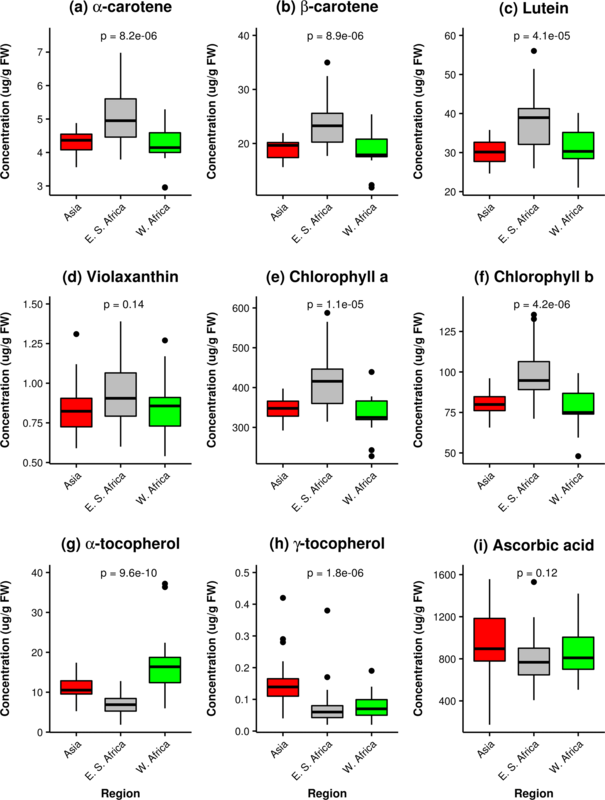 α- and γ-tocopherols have also been identified in significant levels in seven cultivars of Brassica oleracea (Guzman et al. 2012). The levels of α-tocopherol varied from 151.0 to 264.5 µg/g and the levels of γ-tocopherol from 50.9 to 93.6 µg/g. Of the many different forms of vitamin E, α-tocopherol is the most abundant form in nature and is the form preferably retained in human body (Jiang 2014). The concentration of α-tocopherol, the predominant form in G. gynandra leaves, ranged from 1.8 µg/g FW in TOT8889 (ESA22) to 37.2 µg/g FW in ODS-15-013 (WA6) with a coefficient of variation of 56.6%, while the concentration in γ-tocopherol ranged from 0.02 µg/g FW in TOT6421 (ESA15) and TOT8892 (ESA25) to 0.4 µg/g FW in TOT7198 (AS14) with a coefficient of variation of 73.5%. West African accessions had higher average levels of α-tocopherol compared with accessions from the other regions (Fig. 2g). In contrast, Asian accessions had the highest levels of γ-tocopherol (Fig. 2g). To our knowledge, this is the first report of vitamin E quantification in G. gynandra. Levels of α-tocopherol comparable with our results were reported in other vegetables including lettuce (1.5–3.6 µg/g FW), watercress (7.2 µg/g FW) (Cruz and Casal 2013) and broccoli (27.2 µg/g FW) (Granado-Lorencio et al. 2007). A ninefold variation in ascorbic acid (vitamin C) was observed in the collection from 173.7 µg/g FW in TOT7197 (AS13) to 1556.8 µg/g FW in TOT4935 (AS8) with an average of 849.1 ± 272.8 µg/g FW and a coefficient of variation of 31.9%. Jiménez-Aguilar and Grusak (2015) also indicated high levels of ascorbic acid, ranging from 1060 to 1400 µg/g FW in G. gynandra accessions collected in Zambia. No geographic pattern of variation was associated with ascorbic acid levels in the collection (Fig. 2i). The large variability in the levels of the selected nutrients in the collection provides an important opportunity for breeding the species for higher nutrient contents. However, correlations between nutrients and between nutrients and morphological traits are critical for the design of appropriate breeding strategies. Accessions were classified in three main clusters based on the factorial analysis of mixed data including the 27 morphological descriptors and the levels of nutrients (Fig. 3a). The first cluster included only accessions from West Africa (100%) (Fig. 3a). Cluster 2 predominantly consisted of accessions from Asia (92%) with few accessions from East–Southern Africa (8%). Accessions in cluster 3 were mainly from East–Southern Africa (97%) with some accessions from West Africa (3%) (Fig. 3c). Overall, clusters 1 and 2 made of accessions from West Africa and Asia, respectively, were closer than cluster 3 which encompasses mainly accessions from East Africa. Similar patterns of relationships between G. gynandra accessions from the three regions were revealed by Reeves et al. (2018) based on internal transcribed spacer sequences. Wu et al. (2017) previously compared morphological features between African and Asian accessions of G. gynandra and showed differentiation based on geographic origin. However, their study included only accessions from East and Southern Africa and none from West Africa. All the qualitative traits except leaf blade lobbing, leaf pubescence and leaf oiliness contributed to the classification of the accessions (Table 3). 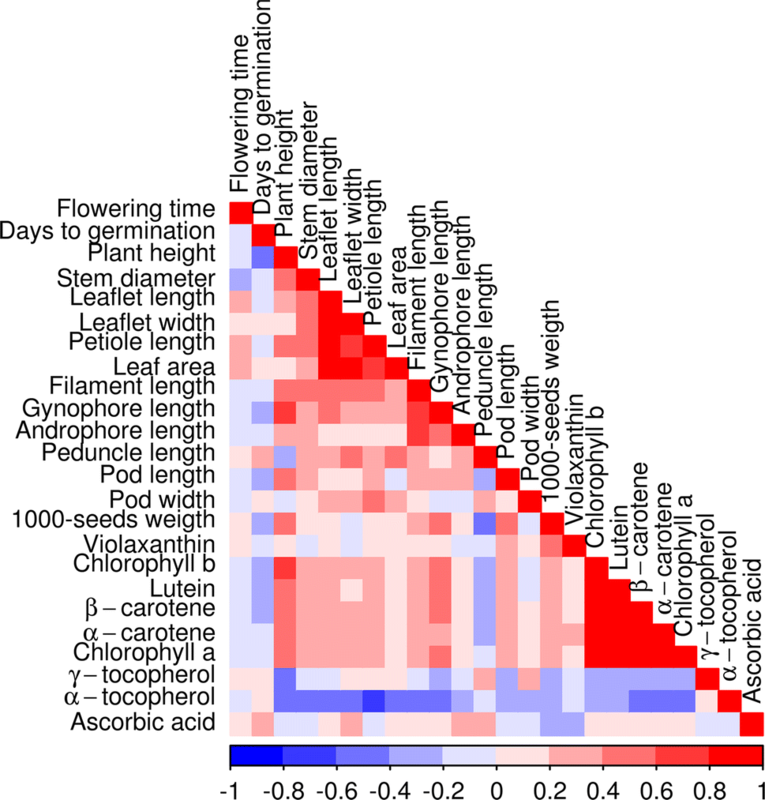 Morphological quantitative traits including plant height, leaflet length, leaflet width, filament length and pedicel length as well as levels of β-carotene, lutein, chlorophyll a and α-tocopherol were the most important variables which contributed to the differentiation of the accessions (Fig. 3b). Cluster 1 was characterized by short plants with small leaves, high levels in α-tocopherol and relatively low levels in carotenoids. Cluster 2 included accessions with short plants, broad leaves and long pedicels and relatively low levels of carotenoids and high levels of tocopherols, while Cluster 3 was made of accessions with tall plants and high levels of carotenoids and chlorophylls (Fig. 3c; Table 4). The Pearson correlation matrix indicated significant positive correlations between lutein, α-carotene, β-carotene, chlorophyll a and chlorophyll b (Fig. 4). Significantly positive correlations were observed between levels of carotenoids and chlorophylls and plant height, leaflet length, petiole length, filament length, gynophore length, pod length and 1000-seed weight, suggesting that taller and bigger accessions with dark green leaves are likely to have higher carotenoids content. In contrast, strong negative correlations were observed between α-tocopherol and plant height, stem diameter, leaflet length, leaflet width, petiole length, leaf area, filament length, gynophore length and androphore length, carotenoids and chlorophylls. The correlations between morphological traits and carotenoid, tocopherol and chlorophyll content might be explained by the fact that the morphology of the different accessions evolved as a response to various environmental factors as was also the case for the production of photosynthesis-related compounds such as carotenoids, tocopherols and chlorophylls. No significant correlation was found between ascorbic acid (vitamin C) and other nutrients. Carotenoids (pro-vitamin A), ascorbate (vitamin C), tocopherols (vitamin E) all play a major role in the elimination of reactive oxygen species in chloroplasts (Asensi-Fabado and Munné-Bosch 2010). However, while the carotenoid, tocopherol and chlorophyll biosynthetic pathways share geranylgeranyl diphosphate as a precursor, there is no direct relationship between these pathways and the biosynthesis of ascorbate. Phenotyping of segregating populations from crosses between contrasting parents will be required to further investigate the observed correlations between morphological traits and vitamin content. The summary of the differences between the three clusters of accessions is presented in Fig. 5. Both carotenoids and tocopherols are synthesized in whole or in part from the plastidic isoprenoid biosynthetic pathway (DellaPenna and Pogson 2006). As carotenoids, tocopherols and chlorophylls are photosynthetic pigments, we expected positive correlations among those compounds. However, Reeves et al. (2018) observed variation in photosynthesis-related traits in G. gynandra which corroborate the differences that we observed in terms of carotenoids and tocopherols content. The authors found that compared with East African accessions, Asian and West African accessions had higher water use efficiency, lower density of stomata and veins and larger bundle sheath areas and cell sizes. Moreover, the Asian and West African accessions had increased expression of genes encoding C4 enzymes. Such genetic variation could be induced by geographic or environmental isolation of different populations adapted to local conditions and with limited gene flow among them (Kleessen et al. 2012; Prunier et al. 2017). Several studies documented the geographical patterns of intraspecific differentiation in plant morphology (Pucher et al. 2015; Upadhyaya et al. 2017) and phytochemical profiles (Bellomo and Fallico 2007; da Silva et al. 2017; Masetti et al. 2017; Shepherd et al. 2017). We hypothesize that the observed trade-off between carotenoids and tocopherols associated with geographical origin could be explained by differential expression of some genes involved in carotenoid, chlorophyll and tocopherol synthesis. Depending on whether important genes or transcription factors are upregulated or down regulated in the accessions, the synthesis of rate-limiting precursors on carotenoids, chlorophylls and tocopherols biosynthesis might be affected. For example, phytol released during chlorophyll degradation is essential for tocopherol biosynthesis in plants (vom Dorp et al. 2015). Wunnakup et al. (2018) observed that the transient expression of the homogentisate phytyltransferase (HTP) gene from Clitoria ternatea L. in tomato leaves led to an increase in α-tocopherol biosynthesis and caused the degradation of chlorophylls. These convergent results suggest that chlorophyll/tocopherol ratio in plants may vary depending on the levels of expression of HTP. Further studies are required in Gynandropsis gynandra to elucidate the regulation of isoprenoid biosynthetic networks in the species. Another explanation could be that late flowering accessions from East Africa had higher levels of carotenoids than West African and Asian accessions which already started flowering at the time of leaf sampling. The effect of developmental stage on the levels of these compounds in the leaves should therefore be investigated. For example, Ma et al. (2016) reported a decrease in the levels of carotenoids in Chrysanthemum morifolium leaves during flower development. Tracing back the origin and colonization routes of the species could also be helpful to elucidate the differences observed in the populations from the three regions. Feodorova et al. (2010) hypothesized that the speciation event leading to G. gynandra occurred in South Africa but their sampling was limited to accessions from South Africa and Australia. The absence of correlation between Vitamin C and the other nutrients will facilitate breeding for high levels of both vitamin C and carotenoids or tocopherols in the species. Our results showed that morphological traits and levels of isoprenoids (carotenoids, tocopherols and chlorophylls) analysed varied significantly among geographic regions. We also established correlations between morphological traits and the targeted nutrients. 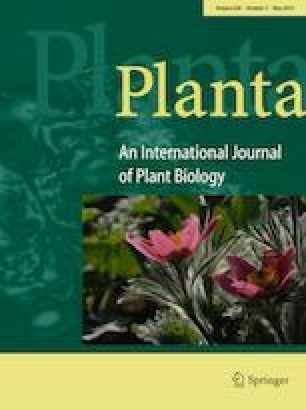 Such information is critical to design breeding programmes aiming at improving the nutritional value of the species with emphasis on pro-vitamin A, vitamins C and E. The trade-off observed between carotenoids and tocopherols is reported for the first time in a plant species and requires further investigation of the genetic regulation of the biosynthetic pathways underlying these metabolites in G. gynandra. Moreover, the differences in metabolic profiles across plant developmental stages should be assessed. The ninefold variation in vitamin C and the absence of correlation between this compound and the other nutrients specifically provides a great opportunity for breeding towards new varieties with improved nutrient compositions. Based on our results, parental lines with contrasting morphology and metabolite contents from East Africa and Asia have been selected and crossed for the development of mapping populations to accelerate breeding efforts in the species. The impact of cooking on the levels of the nutrients in the species and the potential contribution of the different compounds to recommended daily intakes should be further investigated. Moreover, we are currently analysing the variation in the metabolome of the species using a subset of 52 accessions and such information would be valuable to determine anti-nutritional factors and their potential correlation with health-promoting compounds in the species. Analysing the variation in the collection at the metabolome and the genome levels could also allow to determine whether the geographic patterns of variation observed in the collection at the morphological and biochemical levels are simply due to environmental plasticity or indeed driven by genetic differentiation due to isolation by distance. MES, RCHV and EODS conceived and designed the research. EODS and DK conducted the experiments. EGA, PM, TS and AVD contributed to the collection of plant material and phenotypic data acquisition. EODS drafted the manuscript. EGA, PM, TS, AVD and RCHV critically revised the manuscript. All authors read and approved the final version of the manuscript. We thank the Genetics and Plant Breeding Unit of the University of Ouaga 1 Prof. Joseph Ki-Zerbo for providing us with accessions from Burkina Faso; Harry Jonker and Bert Schipper for their assistance with the HPLC analyses and Maarten Peters for the greenhouse management. This study was supported by the Applied Research Fund of the Netherlands Organization for Science under the Project “Utilizing the genome of the vegetable species Cleome gynandra for the development of improved cultivars for the West and East African markets” (Project Number: W.08.270.350), the Schlumberger Foundation Faculty for the Future Fellowship awarded to E.O.D.S. and the African Orphan Crops Consortium.